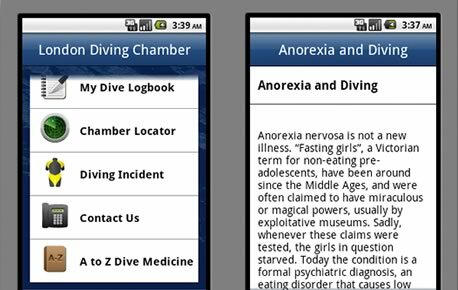 Silver Rocket Digital has released a beta version of the London Diving Chamber app for Android, to accompany the existing iPhone/iPad version. 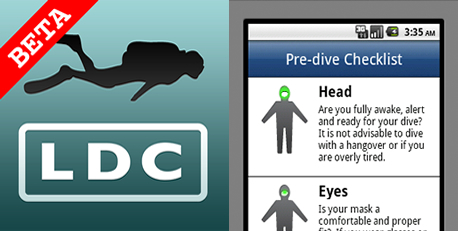 Built using the Titanium platform, the London Diving Chamber (LDC) Android application is designed as a key resource for scuba divers. It has advice and easy-to-follow instructions for what to do in an emergency, whether a diver is suffering from the bends, has problems equalising; has been stung by a jellyfish or many other common incidents that may be experienced on a scuba diving trip or holiday. If a diver is suffering from decompression illness (the bends) this application will use your current location to work out where your nearest decompression chamber is. There is a practical pre-dive check list that will go through the key points to ensure you are both physically and mentally ready for your dive. The extensive A-Z of diving medicine in this application will answer many of your dive medical questions and if you cannot find what you’re looking for then you can simply send in your query direct to the doctors at London Diving Chamber who will get back to you. In addition, this application has a dive log book facility that enables you to log your dives. The app can be downloaded from the Google Play Marketplace.